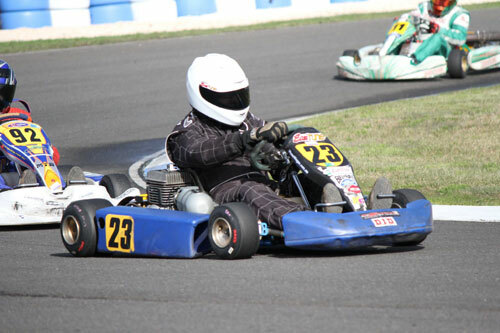 Portland and District Kart club has successfully hosted round four of the Austrans Victorian Country Series at its Yarraman Park circuit a week ago. Rain and cool temperatures greeted the converging competitors on Saturday, before a wet start on Sunday. By half way through the opening round most of the track was dry and the racing intensified accordingly. 122 entries faced the starter on a weekend the club remembered treasured member Colin DeVries, with his memorial race for Clubman Light. Mathew Steel and Cory Arnett proved to be the front runners in the heats of the Rookies class, taking a win and a second each. Tyler O’Leary and Nathan Williams picked up third places, making up the fast quartet at the front of the field. Pole man Arnett got jumped by Steel, Williams and O’Leary on the opening lap of the main event, and would go to finish fifth. Mathew Steel claiming victory from hard charging O’Leary, who had moved to second on lap three, and Williams further back in third. Clubman Heavy is in danger of being re-named Chris Thomas class, after the master took another clean sweep, meaning he has a worst result of second in two heat races this series. Series newcomers Ryan Aitken and Justin Keiller found the podium in the heats, Aitken crossing the line second in the final. SA’s John Dankowski recovered from a first up DNF to complete the top three. Geelong’s Brock Rae had his team working hard with last minute tyre changes, but it proved worthwhile with two heat race wins. Jett Speed was going about business quietly with a pair of thirds, whilst Craig Scanlon and Stuart Reed couldn’t back up their second places in the opposing heats. Rae and Speed lined up on the front row, and again the man on the outside got the jump, Speed showing a great turn of speed to drive away to a five second plus victory. Shaun Lyness was on the charge, moving from sixth to second in three laps, and took a fine second place. Sam Rofe had his best run of the series, despatching Rae on lap four to snare a fighting third place. A small field of clubman light formed for the prestigious Colin DeVries memorial race, but the numbers were deceiving, as the racing was as good as any. Hamilton’s Maverick Benson struck the first blow in the damp conditions, taking the win over Kyle Rethus and sideways Adam Holt. Benson and Rethus would swap positions in heat two, Mathew Keiller taking third. Kyle Rethus is generally a man in a hurry, and the final again proved this, winning comfortably to continue his unbeaten run in series finals this year. Benson was the best of the rest, Keiller recovering from his bucks night for third. As usual the smallest competitors put on some of the most intense racing of the weekend. Series ‘heavyweights,’ George Gower and Jonathon Cassar were at the forefront, sharing the wins and the seconds in the heats. Braydon Callaghan and Courtney Prince filling heat race podiums. 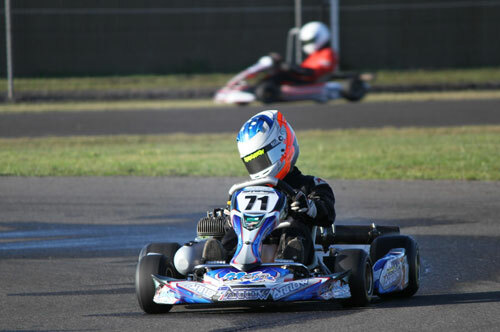 Cassar headed into the final with pole and the previous three round wins behind him, but the day was to belong to George Gower. Although Gower would lead every lap, his winning margin would be under a tenth of a second to Cassar, who waged a great battle with Sean Larkin. Cassar sealed second place, with Larkin in third, and both less than a second behind Gower. Junior National Heavy was missing its series leader Jaymi MacKay at the fourth round, but newcomer Aaron Cameron sure filled her shoes. 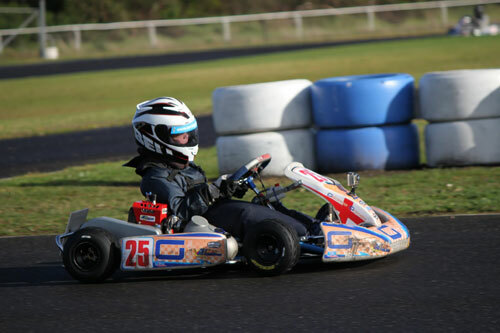 Cameron taking a clean sweep of the 13 kart field, a great effort in differing conditions. 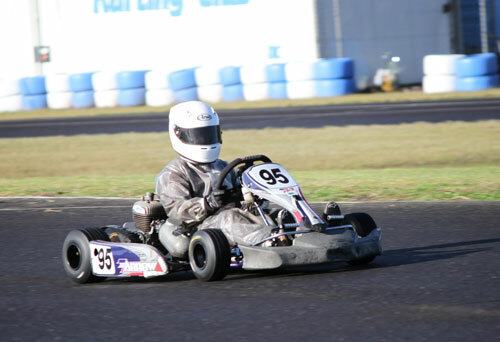 MacKay’s younger brother Mitchell stepped up to heavies and a proven kart taking second in both heats. 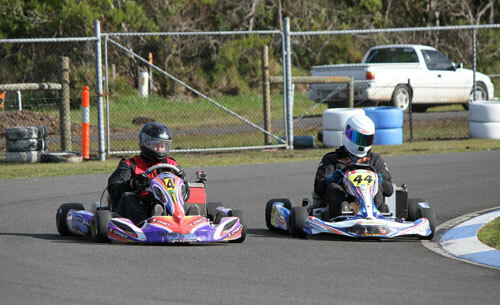 SA drivers Morgan Feast and Sam Baker ran well, filling the third places. 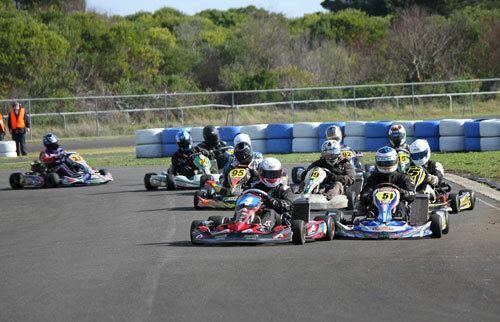 The Mt.Gambier boys, Feast and Baker, would end a good weekend with second and third respectively in the final event. Rain Master Andrew Stubbs was at it again in the opening heat of over 40’s, taking a fine first up win. Rodney Westbrook adapted well to the conditions to fend of Ron Taylor for second. 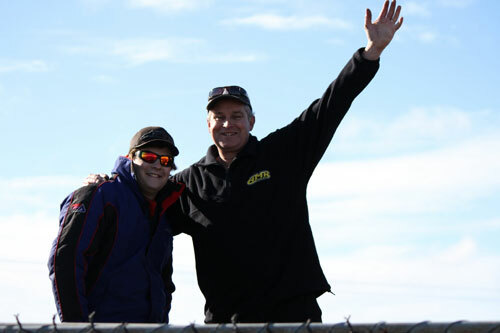 Craig Arnett set the pace in heat two, leading every lap to record the victory over Glenn Henley and Taylor. Taylor and Arnett lead the field away in the final, Arnett leading the first lap before Henley moved into the lead on lap two. Arnett held second, until he was sent off track and out of the race by a desperate Leon Forrest. Taylor subsequently moved into second, and held that position till the end behind run away final winner Henley. Forrest crossed the line third, but was DQ’d, handing the final podium spot to Craig Jelbart. Kyle Rethus was simply untouchable in TAG Light. Not even a new chassis could unsettle the teenage tyro as he swept the race wins in the class. Behind Rethus, the racing was fierce, with Ashley Lear, Harley Benson, Broe Sheills and Scott Andrews all finding top three positions in the heats. Andrews in particular stepped up the challenge in the final, setting the fastest lap on his way to second place. Lear fended off Shiells for the final podium spot. Another class to have a driver clean sweep, was SRH, and the driver was Anthony Warner. Warner added to his Warrnambool round win in perfect style, as he makes a run towards end of series results. Ever consistent Barry Clough took second in each race, with Brian Brook and Adam Holt snaring thirds. Holt got it together to finish the final third after the wheels almost fell off in the opening heat. Local ace Scott King went into his home round having dominated the class, and winning the final at all of the previous events. TAG Heavy had some tough competition with Corey McCullagh and another local legend Daniel Rethus taking the heat wins. King was positioned nicely in second in both events with Ryan Aitken in third both times. The final was set to be a cracker with the fast four finally going head to head from the start. It didn’t disappoint, after twelve laps the top three crossed the line within a second, King from McCullagh, Rethus in third. Junior National Light was once again all about Dylan Hollis. The diminutive champ continued to win at will claiming a fourth consecutive round win. Hollis was followed home by Thomas Hughes and Morgan Feast in the first heat, before Aaron Cameron beat home Hollis to win heat two. Hughes was again in the mix in third. Hollis drove away to victory in the final, however the battle for the minors was on. Cameron, Hughes and Feast went at it, Hughes crossing the line second ahead of Cameron in a close fought battle. Full results are available on the CM:S.
The Austrans Victorian Country Series continues in Hamilton on September 15th, and is brought to you by valued sponsors Austrans, Remo Racing, All Star Graphics, Yes Optus Warrnambool-Portland-Hamilton, Shamick Racing and Yamaha Australia.